New Hampshire Theatre Project’s home is at the West End Studio Theatre (WEST), 959 Islington Street, Portsmouth, NH. Look for the big 959 on the signpost at the entrance, and the theatre can be found around the corner. Travel south on Congress Street through the second traffic light (Maplewood Avenue–Discover Portsmouth Center on the left). The street name changes to Islington Street and becomes a two-way street. Continue straight onto Islington Street. Proceed through two more traffic lights (at Cabot and then Bartlett Streets). 2/10ths of a mile past Bartlett Street, turn right into the driveway for 959 Islington Street and West End Studio Theatre. At the traffic circle take Route 1 By-Pass North. Immediately take ramp to exit uphill toward the Roundabout Diner and the Holiday Inn. At top of ramp, turn right onto Woodbury Avenue and follow around a sharp curve to the left. Woodbury ends in one block at a stop sign. Turn right onto Bartlett Street and follow around a sharp curve to the left and under a railroad underpass. At the traffic light, turn right onto Islington Street. Proceed 2/10ths of a mile past Bartlett Street, turn right into the driveway for 959 Islington Street and West End Studio Theatre. From exit 3B take a right onto Route 33. After the road narrows to one lane, take a left at the next traffic light onto Islington Street. 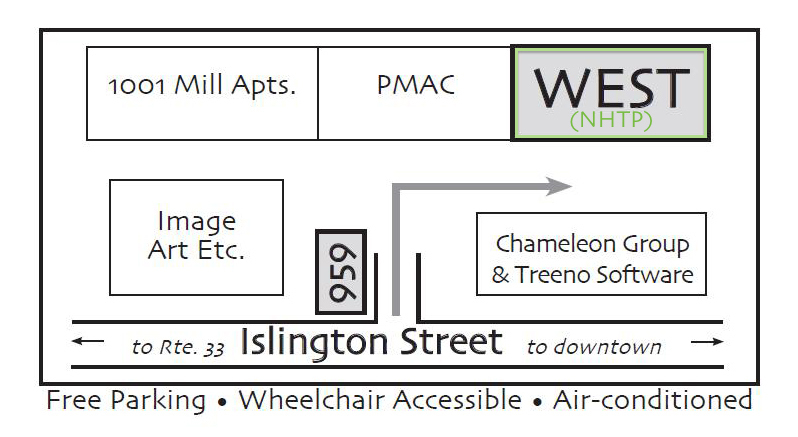 Proceed 8/10ths of a mile, turn left into the driveway for 959 Islington Street and West End Studio Theatre.